Dina Mackney rock star enhancer. Necklace, shown, is not included. 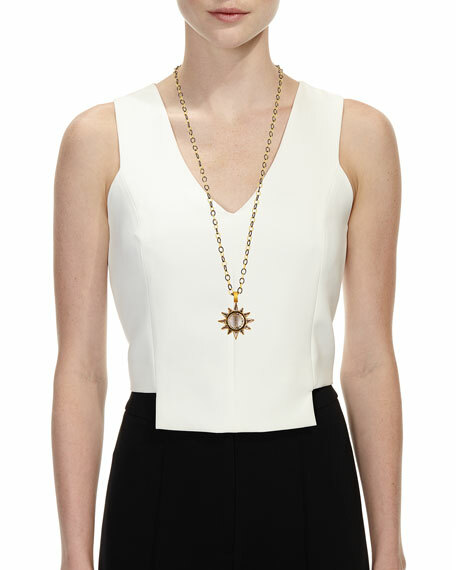 Alexis Bittar tassel pendant necklace. Yellow golden and rhodium-tone plating. Hand-sculpted, hand-painted Lucite??. Crystal encrusted teardrop silhouette. Multi-strand rolo chain dangles. Approx. 32"L. Made in USA. Crumpled bib necklace from Alexis Bittar. Silvertone plating over brass hardware. Multi-strand snake chains with charms. Mixed crystals and crumpled pendants. Brilliant-cut clear crystal dangles. Approx. 18"L; 3"L extender. Adjustable; lobster clasp. 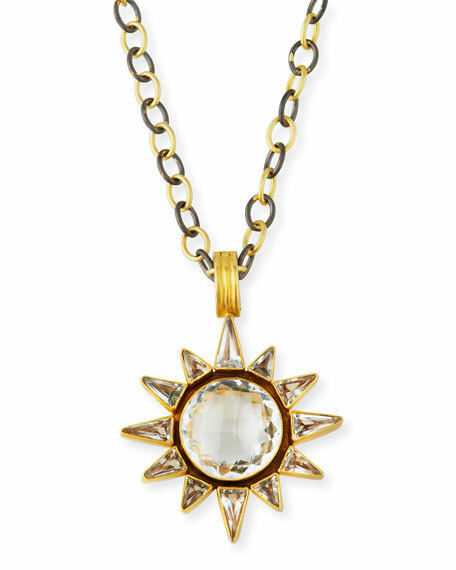 Sterling silver and 18-karat solid yellow gold with natural cultured pearl detail. 1" x 1". Made in Greece. Please Note: Chain sold separately.